In the past few weeks I’ve had to take several trips into the “old city”, the part of Krungthep (Bangkok) that is on or adjacent to Rattanakosin Island. Located at a bend in the Chao Phraya River, Rattanakosin Island was created when King Rama I moved the capital of Siam from the west side of the river in Thonburi to the more defensible west side. He ordered a canal dug running roughly north-to-south and thus turned this portion of the west bank into an island. Many of the most famous sights in Krungthep – the Grand Palace and the Temple of the Reclining Buddha, for example – are located on Rattanakosin Island. Of course you would be hard pressed to know it is an island as the roads cross the narrow canal so quickly and subtly that you just transition from one congested part of the city to another. But, yes indeed, you are on an island. Squeezed between Rattanakosin Island and Yaowarat (Chinatown) is the Phranakhorn neighborhood. 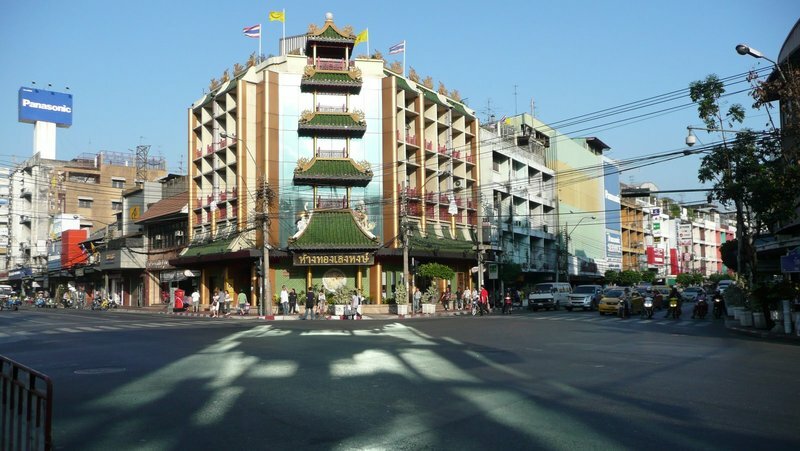 This is the location of the Old Siam shopping center, which houses three stories of shops specializing mostly in silk. The alleys radiating through this neighborhood (especially the three blocks of Soi Sampheng) are a treasure trove of adventures, especially if you like shopping for fabrics and associated knickknacks. At one of the intersections on the edge of Chinatown, a surprisingly traffic-free moment. That changed about two seconds later as the light going the other way turned green. I think the light reflecting off the building created an interesting pattern. A typical corner in the Phranakhorn neighborhood. You see traditional four-story shop houses alongside more modern structures. Busses of many colors (the blue and red busses are not air conditioned) crowd the streets. The car park at Old Siam (which I previously didn’t realize they had!) offered some hazy views of famous sights in the old city. 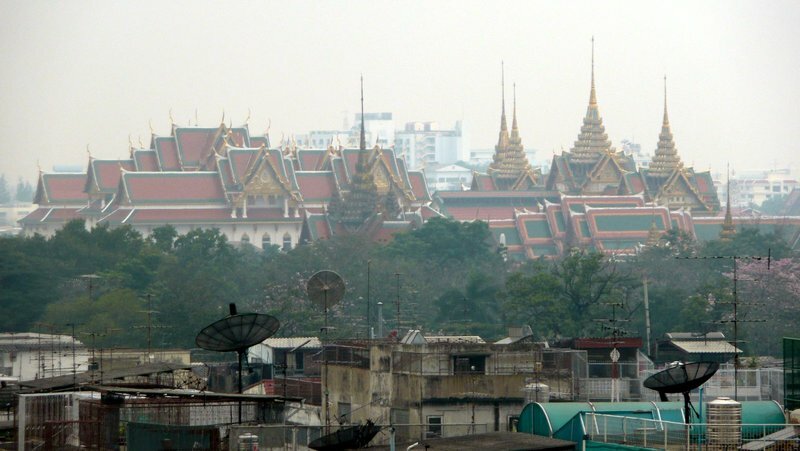 Here are the roofs of the Grand Palace and Temple of the Emerald Buddha. Turning almost 180 degrees, you can see Wat Saket, known as the Golden Mount, perched atop the only hill in the greater metropolitan area. This man-made hill came into being early in the 19th century when King Rama III commissioned the construction of a massive chedi (pagoda). Unfortunately, it collapsed. King Rama IV had the remains built into a hill with another chedi (the present one) built on top. 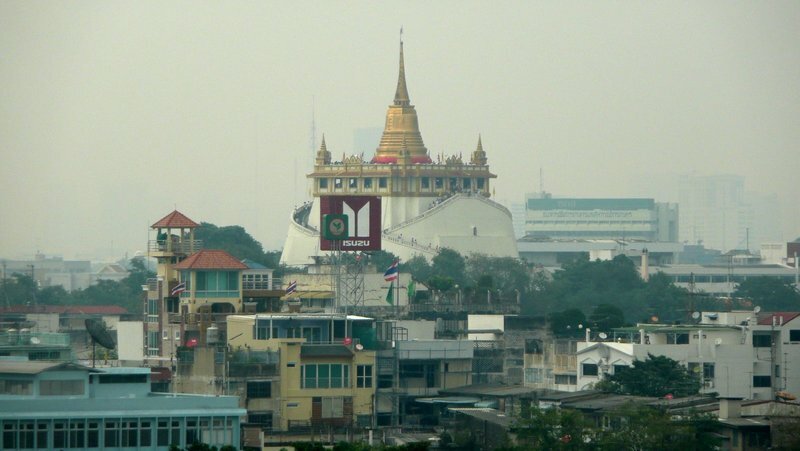 For years before the advent of skyscrapers, Golden Mount was the highest point in Krungthep and visitors would visit to take in the commanding view of the city and to enjoy the breezes. In the evening, driving back from the old city, this picture was taken just as the light turned green around the corner from the Hualamphong train station. I hope you enjoyed the mini-tour. This entry was posted in Uncategorized and tagged Bangkok, Krungthep, Rattanakosin, Thailand by christao408. Bookmark the permalink. I did indeed enjoy this tour! The palace is beautiful – at least the roof is… You are correct about the shadow on the street from the reflection of the building – is the front mirrored?? Lovely pics! Thanks!! I absolutely did enjoy! The photographs are interesting, but my favorite of course is the first one- the traffic free view of the building and the reflections really make it stand out. Nice pictures. It’s nice to see some history and some of the “modern yet not new” parts of BKK. Thanks for the mini tour Chris! Great pics – really enjoyed them !Errrm the one you say is the car park – it’sfull of little buildings – how can it be a car park ?And what is that long green thing ? That’s quite a sight for Wat Saket. 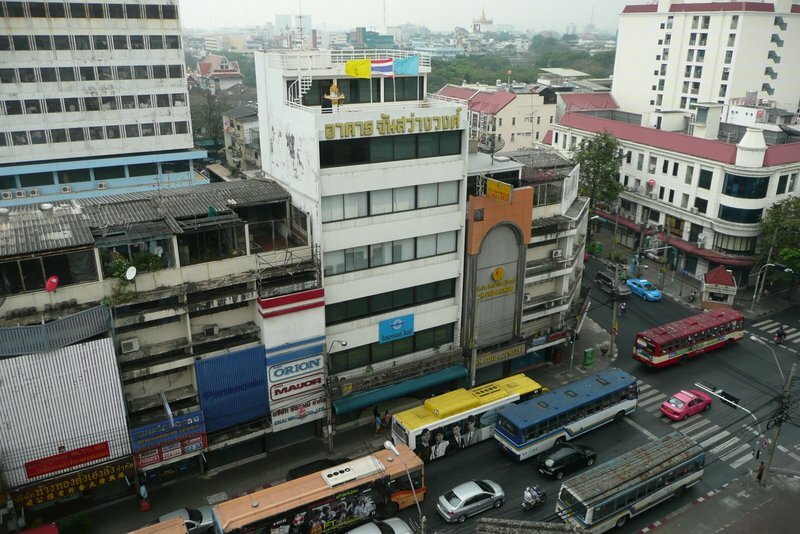 Nice to see recent photos of Old Krungthep once again. More gold shops in Chinatown now? Or the same? @Chatamanda – I took the picture from the car park; it isn’t of a car park. As for the long green thing you mean the structure on the roof? Some sort of an enclosure, maybe a greenhouse for someone’s roof garden? @CurryPuffy – Some of them have gone out of business. Prices are so high that people are selling gold and nobody’s buying! @yang1815 – @TheLatinObserver – You’re welcome. @Dezinerdreams – @murisopsis – Yes, a mirrored front Val, and I think you both have excellent eyes for pictures! Grand Palace, Temple of the Emerald Buddha, and the Golden Mount are so visually pleasing! I’m really liking the action shot at the end! Very neat indeed. 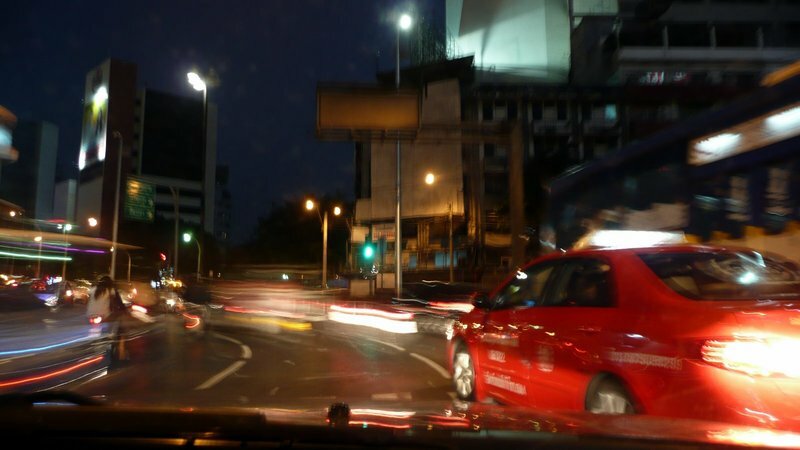 I would be petrified driving in Bangkok. Maybe I’ll plaster my car with amulets to help me. Loved it, esp the first picture! =) I feel like I’ve travelled halfway around the world!! @ElusiveWords – That’s the way to do it, Matt. @lil_squirrel4ever – You feeling better about your loss? @christao408 – Yes, thank you. I’m still missing her–her soft little body, cute little face, and all the tiny things she used to do; I can’t seem to shake these memories from my head. Yet there is also now a sense of calm knowing that she is no longer suffering, and there were so many supportive people around me who made me feel better and took away my guilt about doing the right thing. I think loss is one of the most difficult things in life to deal with, and yet it’s so natural. I know for sure as I get older the reality behind the mortality of those we love is all that much more omnipresent. @lil_squirrel4ever – Isn’t it interesting? The one certainty in life is death and, by extension, loss. And yet it is the hardest thing for us to deal with. I think the suffering comes from an unwillingness to accept this truth. You are the best tour guide I know of Chris. You always amaze me with your picturesque details. Thank you. @ZSA_MD – Thanks. Oh, your friend Sasi had a good trip to Bangkok, it seems. I’m glad I was able to provide some information for her.